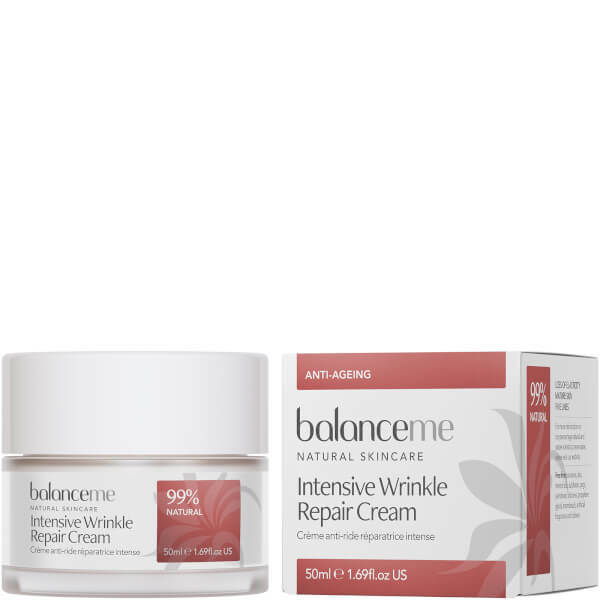 Address signs of ageing with Balance Me's Intensive Wrinkle Repair Cream; a lightweight, daily facial moisturiser developed specifically for mature skin. 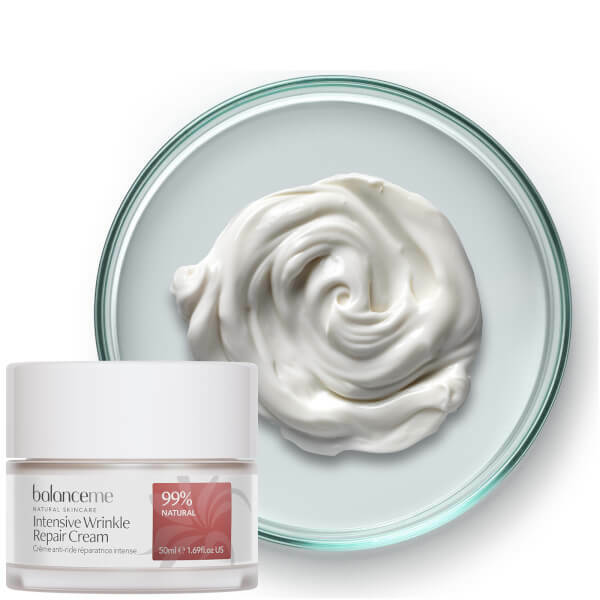 Infused with Hyaluronic Acid, Rosehip Oil and Blackberry Leaf Extract, the antioxidant-rich formula absorbs quickly into skin to deliver intense moisture and hydration, revealing a plump, firm complexion. 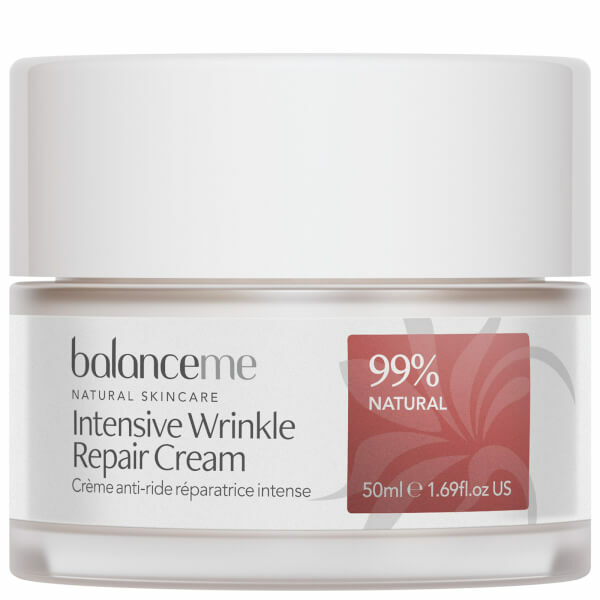 Helps to minimise the appearance of fine lines and wrinkles whilst promoting a bright, youthful-looking glow. Aqua (Water), Coco-Caprylate, Caprylic/Capric Triglyceride, Glycerin (Vegetable), Butyrospermum Parkii (Shea) Butter³, Cetearyl Alcohol, Glyceryl Stearate, Polyglyceryl-3 Dicitrate/Stearate, Cetyl Ricinoleate, Aleurites Moluccana (Kukui) Seed Oil, Crambe Abyssinica (Abyssinian) Seed Oil, Rosa Canina (Rosehip) Fruit Oil, Cellulose, Hydrolyzed Hyaluronic Acid, Rubus Chamaemorus (Cloudberry) Seed Extract, Rubus Fruticosus (Blackberry) Leaf Extract, Spilanthes Acmella Flower Extract, Camellia Oleifera (Camellia) Seed Oil, Mauritia Flexuosa (Buriti) Nut Oil, Aloe Barbadensis (Aloe Vera) Leaf Extract³, Viola Odorata (Violet) Flower Extract, Nelumbo Nucifera (Lotus) Flower Extract, Michelia Alba (Magnolia) Flower Oil¹, Rosa Centifolia (Rose Absolute) Flower Oil¹, Boswellia Carterii (Frankincense) Gum Oil¹, Citrus Aurantium (Neroli) Flower Oil¹, Styrax Benzoin (Benzoin) Resin Extract¹, Cymbopogon Martini (Palmarosa) Leaf Oil¹, Lavandula Angustifolia (Lavender) Flower Oil¹, Pelargonium Graveolens (Rose Geranium) Flower Oil¹, Citrus Nobilis (Mandarin Red) Peel Oil¹, Anthemis Nobilis (Roman Chamomile) Flower Oil¹, Citrus Aurantium Bergamia (Bergamot) Fruit Oil¹, Cananga Odorata (Ylang Ylang) Flower Oil¹, Citrus Limon (Lemon) Peel Oil¹, Coriandrum Sativum (Coriander) Seed Oil¹, Rosmarinus Officinalis (Rosemary) Extract, Tocopherol (Vitamin E), Helianthus Annuus (Sunflower) Seed Oil, Vitis Vinifera (Grape) Seed Oil, Maltodextrin, Chondrus Crispus (Carrageenan), Xanthan Gum, Sodium Stearoyl Lactylate, Benzyl Alcohol, Dehydroacetic Acid, Benzyl Benzoate², Geraniol², Linalool², Farnesol², Citral², Limonene², Citronellol², Benzyl Salicylate². (¹) natural pure essential oil, (²) naturally occurring in essential oils, (³) certified organic ingredient.